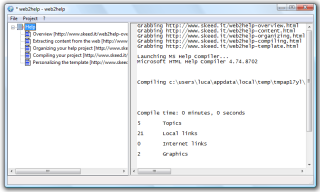 web2help is a free help authoring tool, for quick generation of simple CHM files. As the name suggests, web2help grabs help pages from the Web. This means that you can create the pages with your favorite tool (a CMS or a Wiki, for instance). Then you tell web2help where to look... and your CHM file is ready! N.B. : in order to compile the help file, web2help uses HTML Help Workshop. You need to download it for free from Microsoft. web2help 1.0.3 installer (size: 6.1 MB) for Microsoft Windows 2000/XP/Vista/7. Only for Windows 2000 users: if web2help does not start, then you need to download and install this library from Microsoft. If you need help, visit our user support group. web2help is released under the terms of an open source license, the GNU General Public License version 2. You can download the source code (size: 136 KB) of the program. You can even run the program from the source, without needing to download the Windows binary. You need to install Python (>2.5), wxPython, BeautifulSoup (we recommend to use version 3.0.7a, not 3.1.x, due to this issue) and Genshi. Then enter in the src directory and type: pythonw main.py. I started this project because I could not find a reasonable open source program for authoring help files for Songpress... and because I love editing web pages with MODx! web2help is hosted at Google code. If you like web2help, please consider donating. Any amount of money will be appreciated!